This week’s Movement Minute is brought to you by Senior Agatsu Instructor Tyson LaRone. I call these “rear delt rows”. Wrap a band around your wrists (I prefer these ridiculously strong woven ones) and use rings or anything where your hands aren’t fixed. Relax between reps, but before each row squeeze out against the band with the rear delts, then maintain that squeeze for the whole row. 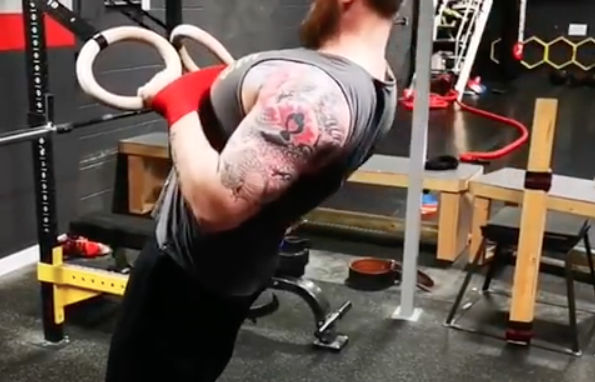 If you aren’t doing specific rear delt focused work, you are extremely likely to have a front/rear delt imbalance which can cause a delightful range of issues. I recommend doing something for rear delts in every single upper body session. If you haven’t trained with Tyson be sure to sign up for one of his Agatsu Strength and Speed Certifications. Courses coming up in Toronto and Montreal.